LinkedIn has become a regular source of leads for thought provoking readings and conversations, especially for sources that I don't necessarily read on an ongoing basis. I am not a regular reader of The Economist, but an article came to my attention through my LinkedIn feed: "Lifelong Learning is Becoming an Economic Imperative." The Economist - January 2017 Special Report on Learning and Earning. Below is a slightly more developed version of a comment I posted on LinkedIn. While I applaud lifelong learning, I don't think the authors of the article go far enough. Technological change demands stronger and more continuous connections between education and employment. We need to move beyond "continuous connections between education and employment." We need much greater integration. They should not be done in parallel. Both the notions of education and employment are evolving, partly as a result of technological change. Technological change is not just affecting the kinds of skills and jobs that are available. Technological change is affecting how we gain new skills and how we think about work and employment. We need to go beyond lifelong learning as currently described in the article. First, they are still equating learning primarily with training and education programs. The fact that these types of approaches are increasingly bring integrated into the workplace with corporate universities and the like is probably a step forward, yet not enough. More is needed in the form of support for workplace learning, that is, learning on the job, learning from experience. I'm a big fan of the approach taken by Jane Hart and her work on workplace learning as well as Jay Cross's work on informal learning. Second, the authors are still equating learning primarily with individual learning, which is great from an individual employability perspective but does not do enough to support organizational learning. More is needed in the form of support for team and organizational learning so that efforts at the individual level are part of a broader approach. 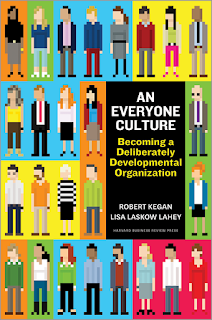 I am currently carefully reading An Everyone Culture: Becoming a Deliberately Developmental organization, for such an approach. Question: Is a deliberately development organization (DDO) better able to anticipate change rather than react to it? One item on my "to do" list is to make better use of labels/tags on this blog. Here are three blog posts I previously tagged for "lifelong learning" (and no comment about their current value). Question: Should blogs go through some form of clean up or should they be left alone to reflect an evolution of thoughts not meant to form a coherent or consistently high quality whole.